the 80th Indiana website are courtesy of the Indiana Historical Society, P415. This image has been electronically cropped and enhanced by Deep Vee Productions. This image is believed to have been taken in 1863 sometime between mid-March and early August. The former is when Culbertson and Tucker were commissioned as Lieutenant Colonel and Major, respectively. The latter is when Colonel Brooks resigned his commission and departed the regiment. During those months the 80th was doing guard duty in central Kentucky at Cave City, Elizabethtown, Glasgow, Munfordville, and Woodsonville. In this image you can see the regiment's then past, present, and future leadership. 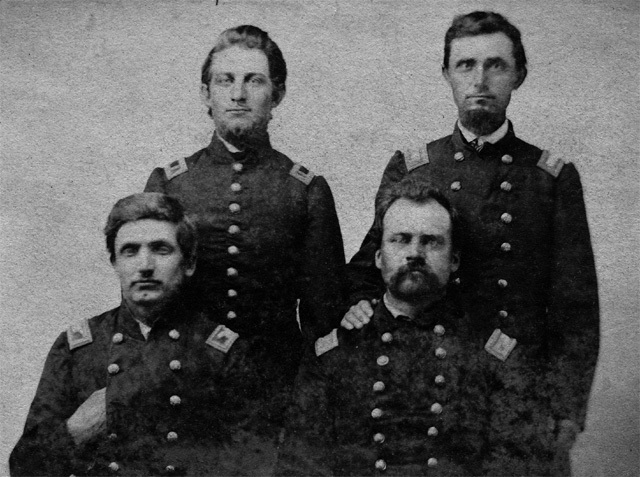 As its Lieutenant Colonel (before a Colonel was commissioned), Brooks had trained and lead the 80th from its initial September 1862 muster-in, through its combat baptism at the bloody battle of Perryville, Kentucky in early October 1862. He then relinquished command to the regiment's first Colonel, Charles Denby, who served from October 1862 until January 1863 when he resigned due to ill health. Brooks was then commissioned as the 80th's second Colonel, leading it until he also resigned due to illness. Culbertson was the third person to serve as the 80th's Lieutenant Colonel. He then became its third Colonel, serving from August 1863 until January 1864 when he too resigned his commission due to health problems. He commanded the regiment while it took part in the cold, hungry campaign to capture East Tennessee. Tucker was the third person to serve as the regiment's Major, gaining that position when Culbertson was promoted to Lieutenant Colonel. He then became the 80th's fifth Lieutenant Colonel, serving from January 1864 until his resignation in September 1864. Due to the illness of its Colonel, Tucker commanded the regiment from mid-May until August 1864, during which it took part in much of the grueling campaign to capture Atlanta, Georgia. Owen was the regiment's first Adjutant and its final Colonel. He served as Adjutant from the 80th's muster-in until October 1863 when he was commissioned as its fourth Lieutenant Colonel after Culbertson became Colonel. Owen held that position until January 1864 when he was commissioned the regiment's fourth Colonel when Culbertson resigned. Except for a period of illness, Owen then led the 80th until it was mustered-out in June 1865 after the war ended. This period included the regiment's bloody repulse at Resaca, Georgia, and the forced march in Tennessee from Columbia to Nashville, including the desperate fight at Franklin. All Rights Reserved. Created May 16, 2005. Last updated May 18, 2005.